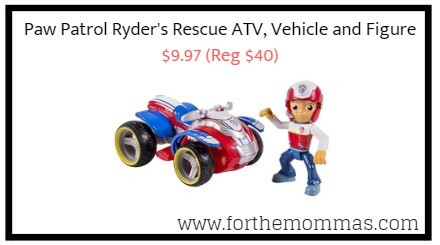 Amazon has Paw Patrol Ryder’s Rescue ATV, Vehicle and Figure for $9.97 (Reg $40) with free shipping on orders over $25.00 or with Amazon Prime Orders. Your little heroes can romp to the rescue with the Paw Patrol pups, as they use their tools, tech, vehicles, and problem-solving skills to save Adventure Bay. Each pup has a unique job and skills, but the pack must always come together as a team to save the day.